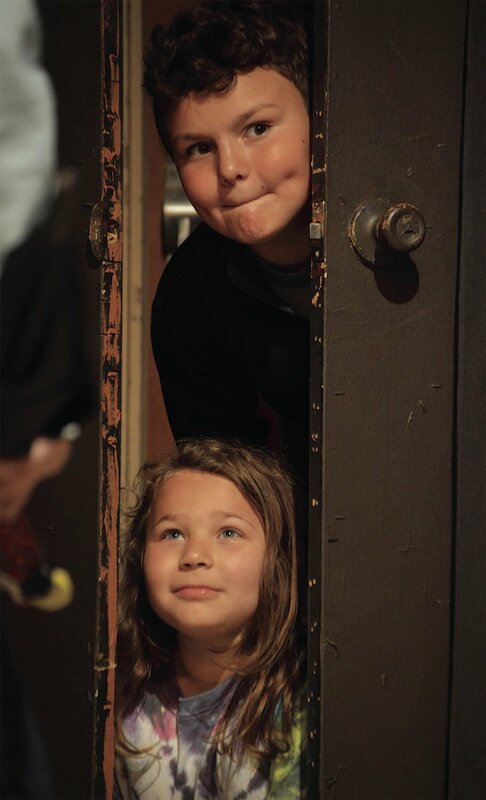 Ruston Graham and Mackenzie Thomas peek from behind a door while rehearsing a scene from “Mary Poppins” that students in the Walker area Talented Theatre program will perform during two productions of “Scene It!” at Walker Freshman High April 12-13 at 7 p.m. both days. Taylor Boyles, left, and John Austin Bergeron rehearse a scene from “Mary Poppins” that students in the Walker area Talented Theatre program will perform during two productions of “Scene It!” at Walker Freshman High April 12-13 at 7 p.m. both days. Cameron Thames read from a burned-looking piece of paper while rehearsing a scene from “Mary Poppins” that students in the Walker area Talented Theatre program will perform during two productions of “Scene It!” at Walker Freshman High April 12-13 at 7 p.m. both days. Ruston Graham, left, and McKenzie Bateman rehearse a scene from “Mary Poppins” that students in the Walker area Talented Theatre program will perform during two productions of “Scene It!” at Walker Freshman High April 12-13 at 7 p.m. both days. Austin Workman examines a sheet of paper that Cameron Thames is holding up as the two rehearse a scene from “Mary Poppins” that students in the Walker area Talented Theatre program will perform during two productions of “Scene It!” at Walker Freshman High April 12-13 at 7 p.m. both days. WALKER -- Where else will you be able to find Mary Poppins, Harry Potter, and the gang from “Friends”? The spring showcase will feature Walker area talented theatre students and is scheduled for 7 p.m. on Friday and Saturday, April 12-13. Tickets are $10 for adults and $5 for students and can be purchased at the door. “Scene It!” will incorporate 16 crowd-pleasing scenes from nine movies and three sitcoms, including “Forrest Gump,” “The Office,” “The Little Mermaid,” “The Little Rascals,” “Full House,” “Home Alone” and more. Students will act, sing and dance in a variety of skits meant to showcase all of their skills, talented theatre teacher Fabiola Reno said. Two seniors — Haley Davis and Ashlyn Marler — will be recognized with “Oscars” during the production, a tradition Reno started to award students who stayed with the program through graduation. Students in grades 2-12 will perform under the direction of Reno. Art design is being done by art teacher Kim Pierson and her gifted and talented art students at North Corbin Junior High.